The latest data from the Bureau of Labor Statistics shows the unemployment rate down to an 18-year low of 3.8%. 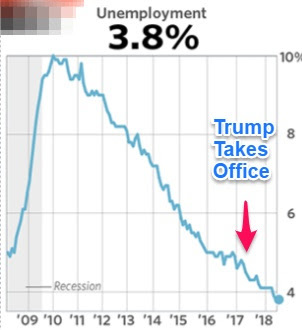 President Trump will surely attempt to take credit for this but as I have pointed out several times, unemployment fell throughout the Obama presidency. And neither Trump nor Obama have had much to do with it. It is all about Federal Reserve manipulation of the money supply---which even some so-called Austrian school economists fail to properly understand. When the Federal Reserve made its first interest rate hike, since the 2008 financial crisis, in December 2015, many Austrian-lites warned that a stock market crash was imminent, that the economy would go back into recession and that the hike would have to be reversed. That sure was a bad series of calls . Since then we have had 5 rate hikes and there is no recession in sight. As I report in the EPJ Daily Alert, there is some very unusual money growth activity at present but still no clear signal of a recession. Stay tuned. I'm doubtful the unemployment rate is what the feds say it is. I find it odd you bash government all the time but somehow believe these BS numbers. Retail stores are still closing in the dozens, subprime car loans are tanking, and new car buyers are not there anymore after the hurricane last year. I was reading through a tire industry magazine at the tire shop and everyone reported substantially lower sales than a year ago. Govt Statistics are the new PR and anyone believing otherwise is a fool. John Williams at ShadowStats does some interesting and valuable work on money statistics. I think the Austrians were and are right in thinking the stock market and economy are bubbles, blown by artificial monetary stimulus, and raising intrest rates should have pricked them, as they predicted. I suspect the Fed is manipulating markets directly, and covertly, and that is the only reason both have not crashed long ago. I also suspect that it is similar intervention that is the reason gold and silver have not shot up to the stratosphere. All this manipulation will continue to work until it doesn't.